Energy-efficient lighting for garage and covered parking areas. The LED models incorporate high quality drivers and LED technology to decrease overall energy demand. 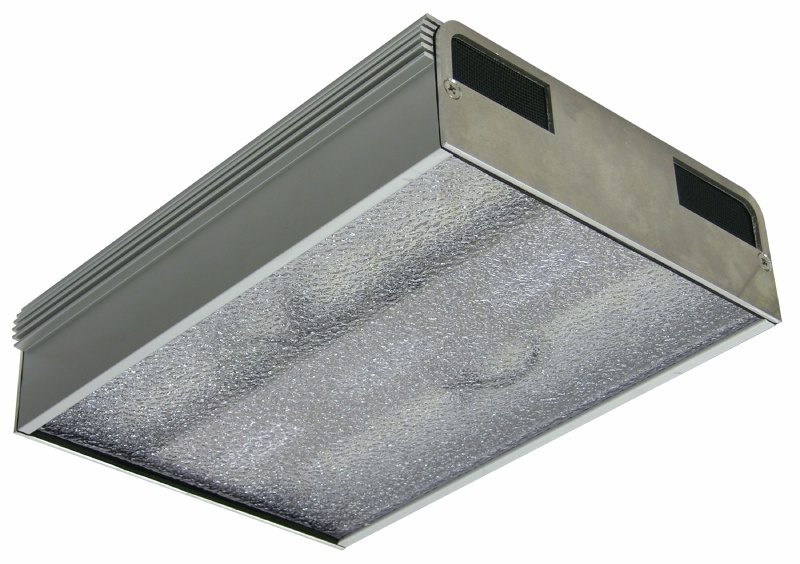 The 1200 series of HID and FL fixtures are quality engineered to resist rust, corrosion, moisture, dust and impact. LED light source. 120V, 277V. Housing in clear anodized aluminum, bronze anodized aluminum or white powder coated aluminum. Lens in clear prismatic or texturized polycarbonate. Mounting options include Junction Box Mount, Pendant Mount, Chain Mount (chain not included), or Flange Mount. ETL Listed (UL 1598). Lifetime warranty against breakage on polycarbonate lens. LED or Fluorescent light sources. 120V, 277V, 347 (Canada). Housing in white fiberglass-reinforced polyester. Lens in clear prismatic or ribbed clear polycarbonate. ETL Listed for Wet Location (UL 1598). Lifetime warranty against breakage on polycarbonate lens and housing. Fluorescent, Metal Halide, High Pressure Sodium, or LED light sources. 120V, 277V, 347 (Canada). Housing in white or bronze polycarbonate. ETL Listed for Wet Locations. Lens in clear prismatic, opal white or frosted clear polycarbonate. ETL Listed for Wet Location (UL 1598). Rustproof tempered marine-grade aluminum base plate. Fluorescent: 12”(Square) x 6-1/4”(D)/6 lbs. HID: 12”(Square) x 8-13/16”(D)/12 lbs. LED: 12”(Square) x 8-13/16”(D)/12 lbs.